One thing I keep hearing about the weather in Central Florida is that if you’re not happy with it you just need to wait a minute and it’ll change. While that’s great for those who like variety, every so often it means that sunny California gets a visit from the space shuttle. That’s the way it went with STS-125 and the crew of space shuttle Atlantis earlier this month. Weather prevented Atlantis from landing at Kennedy Space Center in Florida as was planned and instead had the shuttle landing at Edwards Air Force Base in southern California. Now the task is getting Atlantis back home to Florida where it can be checked and prepped for its next ride into space. To do that NASA hoists it up and attaches it to the back of a modified 747 airplane and ferries it back across the country. My name is Daniel Kanigan and I work for NASA and today my job is to tag along with the shuttle on the cross-country ferry ride and show you how its done. 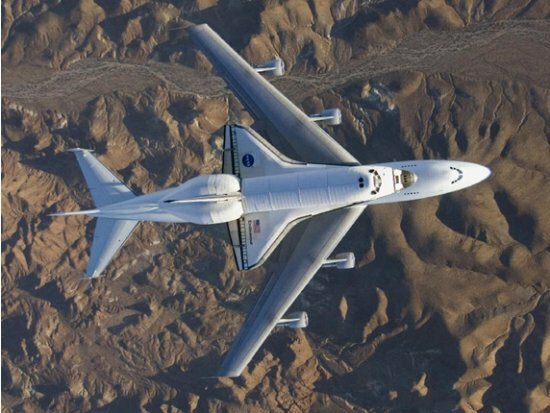 My ride is an Air Force C-9 cargo aircraft, which will fly ahead of the piggybacking shuttle to serve as a pathfinder and help the shuttle carrier aircraft crew avoid rain and other weather that could damage the shuttle. I’ve never been a part of this flight before so we’ll find out together how its done.